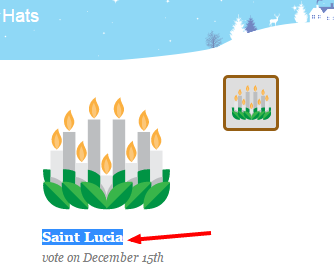 Is there a problem 'wearing' a virtual Saint Lucia hat? Is there any prohibition, perhaps related to lo teileichu b'hukat hagoyim, in "wearing" a virtual hat which celebrates Saint Lucia day? 1 During the three days preceding the festivals of the non-Jews, it is forbidden to do business with them, to lend them something or to borrow something from them, to lend [money] to them or to borrow [money] from them, to resolve your debt to them or to have them resolve their debt to you. Rabbi Yehuda says: One can have them resolve their debt since it causes him distress. They [the Sages] said to him: even though he might be in distress at the outset, eventually he will be joyful. Bartenura points out that we are worried lest the idolator goes to his place of worship on his festival and feels good about his idol and thanks it for the successful deal. This suggests that it is not allowed to give opportunities for the idolators to feel good about their idols. I suggest that Chazal did not want to forbid all business contacts with the idolators and so limited the prohibition to three days preceding the festivals. Now if (1) the origin of this hat is avodoh zoro and (2) by wearing this hat one would be giving any support or encouragement to its adherents ("see our idol is so wonderful even the Jews wear virtual hats devoted to it"), then I suggest that it would be forbidden or at least not encouraged to wear the said hat. But I doubt whether both conditions (1) and (2) are fulfilled these days. What do we think about Father's Day? Is there a problem with saying “for Pete's sake”? Mary Jesus' mother or Mary Magdalene? Are Jews allowed to wish each other “Happy Thanksgiving”? Is there a teshuva which speaks about whether Jean pants are Chok Akum?